Successfully Added Mizuken - Japanese Style Inspired LED Watch to your Shopping Cart. For resellers and you: Just Google "Japanese LED Watch" to see how much these timepieces sell for online. Chinavasion offers the same quality LED watches at tiny fraction of their price, backed by our famous 12 month satisfaction guarantee and award winning aftersale services. Whether you just want a couple for yourself and family, or a dozen to make a nice profit on your storefront, you simply cannot go wrong with our low wholesale price. So what are you waiting for? Click "Add To Cart" right now and we will ship it out tomorrow, guaranteed. Note: This great new product is available with factory direct low china wholesale price. Stocked in our warehouse for immediate order fulfillment and worldwide shipping to any destination whether it's you or your customer. Are you telling me that this sub $20 watch carries the remains of an ancient spirit that my Casio/Gucci/Rolex/Raymont Weil don't? hello...i received all without problems!!! 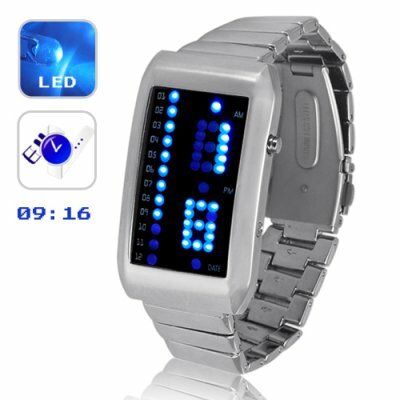 If you like minimilisn that is also eco-friendly and unique then the The LED wrist watch is for you – it shows the time only if you press the button thereby conserving energy. The time is displayed via LEDs and the format is unique and takes time getting used to. Initially you might have to strain to understand the time display but pretty soon you will be able to read the time quite easily. The brightness of the LEDs can be adjusted. It is powered by two tablet cells and is supposed to last a couple of years at least. on 2010-07-01 12:56:39 Nice watch!! !